The New York Mets defeated the Washington Nationals as Space Coast Stadium today by the score of 14-6. Mike Pelfrey got the start and was not sharp. He pitched 3 innings giving up 7 hits and 4 runs with 3 earned. Eddie Kunz pitched a perfect inning. Eric Niesen pitched 1 2/3 innings giving up a hit and 2 runs with 2 walks and 2 strikeouts. Sean Green pitched 1 1/3 innings giving up a hit, walk and 3 strikeouts. Elmer Dessens pitched a perfect inning with a strikeout. Fernando Martinez was the star of the show on offense with 2 homeruns. He ended up 4 for 4 with 2 rbi's. This is the guy the Mets have been looking for and he has been really good this spring. They thought they had a star in the making and maybe now he will live up to his potential. Mike Jacobs had a solo homerun and 2 walks. I think he has a good chance at winding up on the bench but it may come down to him or Frank Catalanatto. Ike Davis continues to impress going 3 for 5 with 2 rbi's. It may be hard for the Mets not to bring him north with them if he continues this. It still is smart though for the Mets to let him get some more seasoning in the minor leagues and if he continues to bring him up in June. Henry Blanco had a hit and rbi and Josh Thole had a hit. The mets prospects are really showing off to the Mets brass so far. The Mets will return to Tradition Field to play the Nationals tomorrow at 1:10PM. There is nothing new with Jose Reyes yet, he will get tested on Wednesday and hopefully will be back by Thursday. I think this may be a problem they can solve with medication but until they say for sure it is scary for the Mets and their fans to think about. It almost seems like last year all over with him and Beltran and Kelvim Escobar, even though they expected it with him. The Francisco Rodriguez issue is still not solved also with the pinkeye. To me that is the craziest one, how can they not know it was pinkeye? How does it take so long to get better?? If you have an answer for me I would love to hear it but I don't think there is an answer. The New York Yankees took it on the chin today losing to the Toronto Blue Jays by the score of 9-1. The story of the game though wasn't the final outcome it was Francisco Cervelli getting beaned in the head and leaving the game. He did seem ok on the field and was helped off of it but did get up under his own power. He was taken to a local hospital for precautionary testing which included a CT scan. The tests were negative and he said he was feeling a little dizzy and had a headache but he should be back in a couple of days. The story of the game on the field would be A.J. Burnett making his first start. He wasn't great but he was happy that he got his work in and did what he wanted to do. He was throwing only a fastball and changeup and as Joe Girardi said, his out pitch is the curveball and if you take that away, it is a different pitcher. He wasn't concerned with the results, just that he got his work in and starts to feel good about his changeup. His line on the day was 1 2/3 innings, 5 hits, 2 runs and 1 walk. He guessed that he threw 10 changeups on the day. Here is what Jorge Posada said about his outing "He's starting it down, that's the big thing. He's finishing it well. There was one of them that was up, hit off the end of the bat, but I thought he did a great job." Boone Logan was very impressive again, in his debut he retired all 4 batters he faced and 3 were lefties. Today he pitched 2 perfect innings with 2 strikeouts. I know it is early but he is really making a case to be the second lefty if the yankees carry one. Jonathan Albaladejo on the flip side was just awful, it was actually painful to watch. He got torched for 7 hits and 5 runs in 1/3 of an inning. He also walked a batter. That is his second bad outing, I don't think he will be making the team out of spring training this year. Mark Melancon continues to impress, the Yankees still have high hopes for him. He pitched 1 2/3 innings giving up 0 runs on 1 hit and had a strikeout. Andrew Brackman who really struggled last year after coming back from Tommy John surgery but has looked better in bullpens was bad today also. He pitched 1 inning giving up 3 hits and 2 runs. The other guys who pitched were Romulo Sanchez who pitched an inning giving up a hit and walk but 0 runs and Jason Hirsch who pitched a perfect inning with a strikeout. The offense didn't do much at all. Reegie Corona, Brandon Laird, Colin Curtis,Austin Romine, Juan Miranda and Kevin Russo all had a hit. If you notice these are all minor league guys. Colin Curtis has been impressive so far this spring and Reegie Corona is a guy they like, he has been known for his defense. Austin Romine is right behind Jesus Montero as top catching prospect and Juan Miranda has had big numbers in AAA and Kevin Russo is a super utility type guy who has a outside chance of making the team. The lone RBI was a groundout off the bat of Ramiro Pena who is the frontrunner to be the utility guy again this year. Francisco Cervelli obviously will not make the trip tomorrow, Mike Rivera will take his place. Amaury Sanit will also not make the trip after appearing in todays game. Dave Eiland confirmed today that Mariano Rivera, Damaso Marte and Chan Ho Park will all throw a batting practice session on Monday. They are the only pitchers who have yet to face live batters. Andy Pettitte is pitching a 2 inning simulated game tomorrow and will move forward as if it was a real game. This will count as his first outing Dave Eiland said. Nick Johnson took batting practice today and felt good afterward. He said "I took a few swings in the cage, felt loose." Kei Igawa pitched well yesterday and Joe Girardi didn't rule out the idea of him creating a place for himself as a lefty reliever. I would bet against him ever pitching for the Yankees again though but you never know. The Yankees will play the Twins tomorrow afternoon in Fort Myers. The New York Mets will take on the Washington Nationals from Space Coast Stadium this afternoon at 1:00PM. Here are the starting lineups via Matthew Cerrone and his blog which can be accessed at http://metsblog.com/ Mets Lineup: Angel Pagan(CF) Fernando Martinez(LF) Jolbert Cabrera(2B) Mike Jacobs(DH) Mike Hessman(3B) Ike Davis(1B) Henry Blanco(C) Kirk Nieuwenhuis(RF) Ruben Tejada(SS) The starting pitcher is Mike Pelfrey and the other pitchers scheduled are Eric Niesen, Sean Green,Elmer Dessens, Travis Blackley and Eddie Kunz. Here are the lineups and some notes courtesy of the Lohud Yankees Blog. Yankees Lineup: Jeter(SS) Granderson(CF) Posada(C) Rodriguez(3B) Winn(RF) Gardner(LF) Cervelli(DH) Miranda(1B) Pena(2B) Toronto Lineup: Bautista(3B) Hill(2B) Lind(DH) Wells(CF) Overbay(1B) Reed(RF) Gonzalez(SS) Snider(LF) Molina(C)Yes it is Jose Molina the former Yankee The game will be broadcast on MY9 in New York and also on the radio WCBS 880. A.J. Burnett will make his first start of the spring against Shaun Marcum. He missed all of last season, and should be one of the guys the Blue Jays look too as he was up and coming before he got hurt. The Yankees PR Dept released this info this morning. Of the 66 players in camp 37 were either originally drafted by the Yankees or signed with the Yankees as non drafted free agents. 23 played in at least one game for the Yankees last season and 27 have appeared in a game for the Yankees at some point in their careers. Andrew Brackman is scheduled to make his spring debut today. The other pitchers who are scheduled for today are: Jonathan Albaladejo, Boone Logan,Mark Melancon, Jason Hirsch,Romulo Sanchez, Amaury Sanit. The position players scheduled to come in the game are Jaime Hoffman getting his first turn in CF, Mike River(C), Jorge Vazquez(1B),Kevin Russ(2B), Eduardo Nunez(SS), Brandon Laird(3B),Colin Curtis(LF), David Winfree(RF) and Austin Romine(DH). Tomorrows scheduled pitchers are Sergio Mitre, Chad Gaudin, Kei Igawa, Wilkens Arias, D.J. Mitchell,Ryan Pope, Amaury Sanit and Kevin Whelan. The game tomorrow is in Fort Myers against the Twins and obviously they aren't sending any of the big guys. Christian Garcia is throwing a bullpen today and scheduled to make his spring debut on Monday. The other guys who are throwing side sessions today are CC Sabathia, Zack Segovia, Zach McAllister and Ivan Nova. Mariano Rivera and Damaso Marte got up to 30 pitches in their bullpens yesterday. They are scheduled to throw tomorrw. Mo said he thinks it is BP tomorrow. Today is Francisco Cervellis 24th birthday so Happy Birthday to him. The Yankees have signed Can Am league player Myron Leslie to a minor league deal. It is on the Can Am website. This is the same league that the New Jersey Jackals play in. Enjoy the game everyone and the nice day. I am hoping you guys will post on these game posts and get some good discussion about the lineups, the battles for roster spots, the game itself even during the games etc. Any other ideas please feel free to let me know, thank you for all the support. Joe Girardi said he didn't read anything into Joba's struggles today. He had been feeling sick and only threw a light bullpen. The Yankees weren't worried about him getting hurt so they figured lets let him pitch. "I am not going to make too much out of it" Joe Girardi said. "You wonder how much he had his legs under him, after being sick for a few days." Phil Hughes showed some good signs, he threw about 8 or 9 changeups including 3 in a row to Ben Zobrist. He didn't show great fastball command but the Yankees as a team didn't. Nick Johnson told the Yankees he could of played today and tomorrow but Joe Girardi will have him sit out until Monday. He will take BP tomorrow. Nick Johnsons right wrist is ok, it hit the ground diving back to first base. He was checked out on the field but Joe Girardi said he is fine. Andy Pettitte, Javier Vazquez, Mariano Rivera, Damaso Marte, Chad Gaudin, Sergio Mitre, Alfredo Aceves and Chan Ho Park each threw side sessions today. The New York Mets lost to the Florida Marlins 4-2 at Tradition Field and defeated the St. Louis Cardinals 7-3 in Jupiter. Jon Niese pitched 2 2/3 innings allowing a run and striking out five. Jenrry Mejia retired all 7 batters he faced and had 4 strikeouts. Ryota Igarashi pitched 2 innings and allowed a solo homerun. Pedro Feliciano allowed a hit but no runs in a inning. Bobby Parnell pitched 2 innings allowing 4 hits, 2 runs and 2 walks. He also had 2 strikeouts. He was in the upper 90's all day but just didn't look comfortable according to Matthew Cerrone. The offense saw Angel Pagan, Wilmer Flores, David Wright, Jason Bay and Rod Barajas each had a hit. Jason Bay had the lone rbi. The other runs were unearned. The game in Jupiter against the Cardinals had Fernando Nieve get the start and pitch 3 innings giving up 3 hits and 1 run with 2 strikeouts and 2 walks. Bobby Livingston pitched 2 innings giving up 5 hits and 2 runs with a strikeout. Nelson Figueroa finished off the game with 4 innings of 1 hit ball, he had 1 walk and 5 strikeouts. That is a very impressive performance by him. Gary Matthews Jr., Alex Cora, Fernando Tatis and Chris Coste all had hits. Fernando Martinez,Ruben Tejada and Sean Riggans each had 2 hits. Frank Catalanotto had a hit in his only at bat. The rbi's were 2 for Catalanotto, 1 for Jeff Francouer, 1 for Fernando Martinez, 1 for Fernando Tatis and Sean Riggans. The Mets will play the Nationals tomorrow in Viera. The New York Yankees lost to the Tampa Bay Rays today by the score of 12-7. It was their 2nd exhibition loss in a row. Phil Hughes got the start and wasn't great but he wasn't terrible either. He gave up a solo homerun which was wind aided. He didn't give up any other hits in 2 innings and gave up a walk. Joba Chamberlain followed him and got lit up. He did lose 8 pounds and said he was probably only at 60 or 70 percent. He said you would of had to chop his legs off for him not to be out there though. He gave up 5 runs and 3 hits with 3 walks in 1 1/3 innings. Kevin Whelan gave up 2 hits, a run and 2 walks without recording an out. Kei Igawa, yes he is still around pitched 1 2/3 perfect innings with 2 strikeouts. Dave Robertson also pitched a perfect inning with a strikeout. Hector Noesi gave up a hit and a run in one inning of work and Grant Duff gave up 2 hits and 3 runs in one inning. He also had 2 walks and a strikeout. Dustin Moseley gave up 2 hits and a run in 2/3 of an inning. He also had 2 walks and 2 strikeouts. Jeremy Bleich faced one batter and got him out. Derek Jeter and Eduardo Nunez each had a hit and Nunez had a rbi. Curtis Granderson went 0-3 but had 2 good at bats against lefties. He is happy he is facing them and getting more oppurtunities. Greg Golson had a rbi and Juan Miranda had a hit and a rbi. Kevin Russo had a hit, walk and rbi. Jorge Vazquez had a hit and a rbi, Robinson Cano and Francisco Cervelli were both 2 for 2. The Yankees will remain at George Steinbrenner Field to take on the Toronto Blue Jays tomorrow at 1 on the Yes network. The New York Mets have split squad games this afternoon, they both start at 1:00PM. The Mets will take on the Marlins home at Tradition Field and play the Cardinals in Jupiter. The big news coming out this morning was that Jose Reyes is headed back to New York to undergo further testing. He apparently was cleared by the doctors in Florida yesterday but the doctors in NY want him to undergo further testing. It looks like he has an overactive thyroid and was told not to do any baseball activities to they figure this out. He will not get the testing done until Monday so he will at least lose these next 3 days and maybe more. I have no idea what this means or if he could be out further but it seems like here we go again with the Mets and their medical issues. In other medical news Francisco Rodriguez still hasn't been cleared to go back to baseball with his pinkeye. I am wondering how long does it take to clear up pinkeye. It is really frustrating for all of the Mets fans especially after last year and it is frustrating to cover this team. It seems like it is always one bad thing after another. Here is the Mets lineups for both games and starting pitchers: Mets Lineup at Home Angel Pagan(CF) Luis Castillo(2B) David Wright(3B) Jason Bay(LF) Daniel Murphy(1B) Rod Barajas(C) Jesus Feliciano(RF) Luis Hernandez(SS) Kai Gronauer(DH) Jon Niese will start for the Mets. Jenrry Mejia, Pedro Feliciano, Bobby Parnell, Ryota Igarashi, Elmer Dessens and Eric Niesen. Mets Lineup in Jupiter Gary Matthews Jr.(CF) Alex Cora(2B) Jeff Francoeur(LF) Mike Jacobs(1B) Fernando Tatis(3B) Fernando Martinez(RF) Omir Santos(C) Ruben Tejada(SS) Shawn Riggans(DH) Fernando Nieve will start this game followed by Bobby Livingston, Nelson Figueroa, Eddie Kunz and Brad Holt. The home game is at 1:00PM on SNY. The New York Yankees will take on the Tampa Bay Rays this afternoon at 1:00PM on the YES network. The game is at George M. Steinbrenner Field in Tampa. This will be the Yankees 3rd exhibition game and their record is 1-1. Here are the lineups and then some pregame notes from the great Lohud Yankees Blog, if you don't check it out or never have you can at http://yankees.lhblogs.com/ Yankees Lineup: Jeter(SS) Granderson(CF) Teixeira(1B) Rodriguez(3B) Posada(DH) Thames(LF) Cano(2B) Swisher(RF) Cervelli(C) Rays Lineup: Bartlett(SS) Rodriguez(LF) Longoria(3B) Zobrist(2B) Upton(CF) Navarro(C) Johnson(DH) Rugiano(RF) Richard(1B) The 5th starter competition will be in full swing with Phil Hughes starting and Joba to directly follow him. Nick Johnson is not expected to play today after experiencing back stiffness yesterday. Brett Gardner, Jaime Hoffman and Ramiro Pena were the only Yankees who started the first 2 games. They started in different positions each time. Nick Johnson said he did some exercises this morning and his back loosened up pretty good. Kevin Russo is ready to go today after missing the last couple of days with a illness. Elliot Johnson is part of the roster today, he is the guy that ran over Francisco Cervelli a couple of years ago in a spring training game. He did also break his wrist in that play. I guess this is something to watch for although I don't think it will be a problem now. The players schedule to come off of the bench for the Yankees today are Jesus Montero(C), Juan Miranda(1B), Reegie Corona(2B), Eduardo Nunez(SS), Kevin Russo(3B), Reid Gorecki(LF), Greg Golson(CF), Jon Weber(RF) and Jorge Vazquez(DH). Enjoy the game everyone and for those working it will be on replay later tonight, I have it on DVR to watch later on tonight, like I am doing for all the daytime games this spring. The New York Mets defeated the St. Louis Cardinals today by the score of 17-11. The big buzz coming out of this game is Ike Davis who is the top prospect and first baseman hitting a absolute bomb for a grand slam. He has looked great and it is almost coming too easy to him. The Mets as tempted as they might be and it is only 3 games so you have to be careful are better served with him in the minors and if he tears it up down there then bringing him up in the summer. Here are the summaries of the pitching and then the rest of the offense. R.A. Dickey got the start for the Mets and allowed 7 hits and 5 runs in 2 2/3 innings. He also walked 2 and struckout 1. Tobi Stoner pitched 2 1/3 innings giving up a hit and a run. He also struck out 1. Jack Egbert pitched 2 innings giving up a hit and 0 runs, walking 2 and striking out 3. Sean Green pitched 2/3 of an inning giving up 2 hits and 4 runs with 3 walks. That was not a good outing for him and Dickey just couldn't get his knuckler going with the wind today. I would imagine that early on also for a knuckleball pitcher must be really hard because it is a feel pitch. Clint Everts got the save with 1 1/3 innings of 1 run ball. He did give up 2 hits and had 2 strikeouts. There is a lot to talk about with the Mets offense, David Wright hit a 2 run homerun and had a walk. Gary Matthews Jr. was 2 for 2 with a rbi. Luis Castillo was 2 for 2 with a walk and a rbi, Jason Bay had a walk but was 0 for 2 in his debut. Daniel Murphy had a rbi and Jeff Francoeur was 1 for 3. Omir Santos was 3 for 3 with 2 rbi's. The Mets said that Jose Reyes is ok and will play tomorrow and they also signed reliever Kiko Colero this afternoon. He last pitched with the Marlins, he is a pretty good pitcher that should serve as their 8th inning guy. The Mets will play the Florida Marlins at home tomorrow. The New York Yankees lost to the Philadelphia Phillies by the score of 3-2 this afternoon. CC Sabathia got the start and wasn't perfect giving up 2 hits and 2 walks in 2 innings. He didn't give up a run though and was pleased with his first outing. He said April 4th is when it matters and he understands what he has to do to get ready. He said that his delivery was so-so and that he had a couple of times where he fell off the mound and wasn't headed toward the plate. He said he will work on that in his bullpen coming up. Roy Halladay who started for the Phillies was his usual self facing the Yankees. He pitched 2 perfect innings with 3 strikeouts. Zack Segovia, Zach McAllister, Ivan Nova and Mark Melancon all pitched scoreless innings. Segovia gave up a walk and Melancon gave up a hit but had 2 strikeouts. Romulo Sanchez pitched 2/3 of an inning giving up 2 hits, a run and a walk. Boone Logan pitched 1 1/3 perfect innings and Wilkens Arias blew a save and got the loss pitching 2/3 of an inning giving up 3 hits and 2 runs, he did have a strikeout. The Yankees offense didn't see anyone get more then a hit. Jaime Hoffman, Jesus Montero, Robinson Cano, Eduardo Nunez, David Winfree, Colin Curtis, Jose Gil and Brandon Laird all had one hit. Colin Curtis is really trying to make a name for himself after hitting a 3 run walkoff homerun yesterday. The rbi's were produced by Jose Gil and David Winfree. Winfree is another one of the outfielders trying to stick as the 5th OF but he is a long shot, Jaime Hoffman is the rule 5 pick who has to make the team and stay on it all year or be offered back to the Dodgers for half the price 25,000. Jorge Posada, Randy Winn and Ramiro Pena all struck out twice. The Yankees will host the Tampa Bay Rays tomorrow afternoon at 1:00PM with Phil Hughes getting the start. Joba Chamberlain is scheduled to pitch also in this game. The game will be televised on the YES network. The New York Mets will take on the St. Louis Cardinals from Tradition Field at 1:10PM today. Jose Reyes was scratched from the lineup because they saw something they didn't like in a follow up to his physical. He said it is nothing serious and I hear that it has nothing to do with his hamstring. This is the Mets though and anything like this has to be a concern but hopefully it is not big deal and he will be back to action soon. R.A. Dickey will get the start for the Mets and Tobi Stoner, Clint Everts,Sean Green and Jack Egbert will also pitch. Here is the starting lineup for the Mets and a couple of notes. New York Mets: Gary Matthews Jr.(CF) Luis Castillo(2B) David Wright(3B) Jason Bay(LF) Daniel Murphy(1B) Jeff Francoeur(RF) Fernando Tatis(DH) Henry Blanco(C) Ruben Tejada(SS) This will be Jason Bays debut with the Mets, the game will also be televised on SNY. Takahashi has returned to the team after getting his visa issues solved. Francisco Rodriguez is still dealing with pink eye and not with the team. It is amazing to me that even something like pink eye turns into a big thing with the Mets. I meant to mention this the other day but WFAN Mets beat reporter Ed Coleman said on one of the shows that he first saw it and said you have pinkeye and K-rod said they told me I don't have that so don't worry about it. The Mets medical staff can't even diagnos pink eye right. I hope they get this mess solved because if this turns bad like last year, there will have to be major changes made all the way around. The New York Mets lost to the Atlanta Braves today at Disneys Wide World Of Sports. The final score was 9-5, the Mets spring record is now even at 1-1. Pat Misch got the start for the Mets and was impressive pitching 3 scoreless innings, he did give up a couple of walks. He only allowed one hit. Eric Niesen pitched 2 scoreless innings giving up a hit and a walk. Eddie Kunz didn't fare so well giving up 4 runs and 2 hits in 1/3 of an inning. He also gave up 3 walks, his era stands at a horrible 108.00. Josh Stinson pitched 1 2/3 innings giving up 3 hits and 5 runs with a strikeout. Only one of the runs was earned. Neal Musser pitched 1 inning giving up a hit and a walk but no runs. I don't know any of these guys except for Misch and Kunz. Angel Pagan, Josh Thole and Daniel Murphy all had rbi singles. Fernando Martinez had a rbi triple. He had a good day going 2 for 3. Mike Cervenak had a rbi single. The Mets committed four errors in the seventh inning, I thought they were working on fundamentals, that is pretty hard to do. Matthew Cerrone has some video and pictures from todays action. He also has a good interview with Gary Matthews Jr. It can all be found at http://metsblog.com. The Mets will take on the St. Louis Cardinals at 1:00PM tomorrow in Port St. Lucie at Tradition Field. The New York Yankees defeated the Pittsburgh Pirates this afternoon in their exhibition opener. The game was tied 3-3 when Colin Curtis hit a walkoff 3 run homerun in the bottom of the ninth to seal the victory for the Yankees. A.J. Burnett wasn't around to deliver the pie, but it was a good start as the Yankees started the way they ended with a win. The Yankees also continued on a trend last year of walkoff wins, they sure seem to love the pie. Here are some of the stats and the notes from today. Alex Rodriguez recorded the Yankees first hit of the spring. Chad Gaudin, Sergio Mitre and Alfredo Aceves each pitched 2 scoreless innings. They each also had a strikeout and Gaudin was the only one who allowed a hit with a infield single to lead off the game. Nick Johnson had a rbi double and made a nice pick over at first. He has always been a good first baseman and will provide great defense when Mark Teixeira is dhing or taking a day off. Jon Albaladejo had a rocky outing, he gave up 2 hits and 3 runs without recording an out. Royce Ring pitched 1 1/3 scoreless innings with 2 strikeouts. Jason Hirsh faced 2 batters and struck them both out. Sanit pitched a scoreless inning. I really don't know much about him but he is a minor league pitcher. Ramiro Pena had a solo homerun, he was the utility guy last season and I would think he is the frontrunner for the same job this season. He started it off the right way and he did make a couple of nice plays in the field, he is known for his defense though. George Steinbrenner was at the field briefly, he was driven through the concourse and quickly driven out. CC Sabathia is scheduled for 2 innings or 35 pitches tomorrow when he faces Roy Halladay and the Philadelphia Phillies. Javier Vazquez threw a bullpen today becoming the last starter to do so, Joba felt better today and threw a bullpen and then went home. If he feels ok tomorrow he will be good to go for Friday. Derek Jeter, A-rod,Mark Teixeira, Curtis Granderson, Marcus Thames, Jon Weber, Francisco Cervelli, P.J. Pilittere and Mike Rivera. If I see this correctly that is 3 catchers which would lead me to belive we will see top prospect Jesus Montero in the game tomorrow. There is Joe Girardi and Curtis Granderson audio up on the great Lohud Yankees Blog by Chad Jennings. You can hear it at http://yankees.lhblogs.com/. The Yankees take on the Phillies tomorrow in Clearwater at 1:00pm, the game is on the MLB network. The New York Yankees opened up their grapefruit league schedule with a game at home against the Pittsburgh Pirates. The game was at 1:00PM but most of you like me are at work and will watch either the replay or DVR of the game later on tonight. Here was the starting lineup and pitchers for the game. 1.Jeter(SS) 2.Granderson(CF) 3.Teixeira(1B) 4.A-rod(3B) 5.Thames(DH) 6.Hoffman(RF) 7.Gardner(LF) 8.Cervelli(C) 9.Pena(2B) Chad Gaudin got the start followed by Sergio Mitre and Alfredo Aceves for 3 of the guys battling for the 5th starter/long man spot on the team. This is the latest the Yankees have had a spring opener since 2005, last year they opened on February 25th. Joba Chamberlain was at the park this morning and he is healthy. He said he slept until 5 yesterday and then went back to bed at 10. He is ready to go for tomorrow. The Yankees also listed 9 players they expected to come off the bench today and they are: C Mike Rivera, 1B Nick Johnson, 2B Reegie Corona, SS Eduardo Nunez, 3B Brandon Laird, LF Colin Curtis, CF Greg Golson, RF David Winfree and DH Jon Weber. A-rod said he has nothing new to day and hasn't heard anything regarding the investigation into the Dr. from Canada. I will be back with some of the game coverage later on tonight. 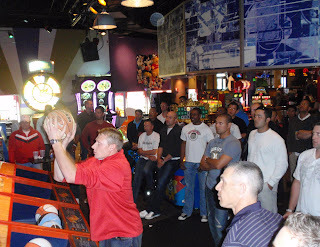 These are different pictures courtesy of the Yankees from yesterdays trip to the local arcade. 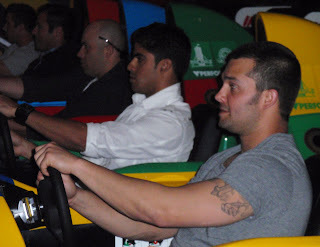 There are pictures of the guys playing pop-a-shot,skee ball and Indy racing. There is a cool pic of Alfredo Aceves on a bike. 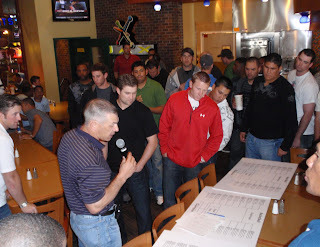 There is also a picture of Joe Girardi going over the rules of the tournament. Carlos Beltran was the latest player to be involved in the FBI investigation into Dr. Galea. He was questioned last week he revealed today. He said that he did get treatment from him for his knee but never had anything injected into him. It appears that he has been cleared as was Jose Reyes. The Mets had their grapefruit league opener today and got off to a great start with a 4-2 win over the Braves. I know it is exhibition but they want to get that winning feeling going early. Nelson Figueroa started and allowed 2 hits and 2 walks over 2 innings. He struck out the side in the second inning and did not allow a run. Elmer Dessens came on in relief and allowed a run on 2 hits and then was hit on the leg by a line drive and had to leave the game. Bobby Livingston who is a non roster invitee replaced Dessens and pitched 2 2/3 effective innings. He struck out four and got the win, which I am sure made him feel good as he is a long shot that is trying to open some eyes. Top prospect Ike Davis had a couple of hits including a double. Ryota Igarashi came on in the ninth and got the save in his first North American action of his career. Jerry Manuel appeared on WFAN today and said that Jon Niese is the front runner to be the fifth starter. He also said Daniel Murphy is the front runner to be the first baseman with Mike Jacobs being a good power bat for the bench. He also sees Angel Pagan leading the race for center fielder until Carlos Beltran gets back. The Yankees will have their first exhibition game tomorrow at 1:00PM against the Pittsburgh Pirates. The game is in Tampa, the pitchers have been announced and they will be Chad Gaudin, Sergio Mitre and Alfredo Aceves who everyone already knew about. The pitchers available out of the bullpen will be Jonathan Albaladejo, Wilkens Arias, Jason Hirsh,Royce Ring,Amaury Sanit and Zach Segovia. 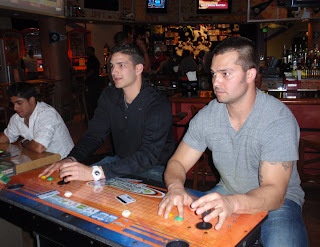 The Yankees went to a local arcade today and took part in 3 different type of games there were in tournament style. 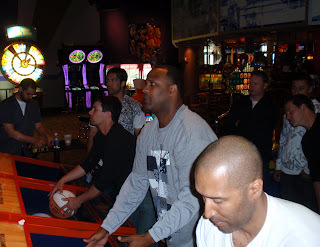 The games were pop-a-shot, some kind of racing game and skee ball. There were four ideas that were thrown out and they were bowling, paint ball, ping pong and a pool party. Here is what Joe Girardi said about them: Paintball-"We thought that was dangerous." I can't disagree with him on that one. Ping Pong-"In pop-a-shot you want to have a soft touch, where in ping-pong they may want to spike it." That I guess is a good point but what could happen, maybe he means they try and do it too hard and hurt themselves. Bowling-"Pitchers arms, you get concerned." I can see his point but I don't think it is that strenous. Pool Party-"That had stubbed toes written all over it." I just think he didn't want to see grown men in speedos or whatever swimming attire they would of worn. Here is a recap of the action that took place today: Indy Car-Winner-A.J. Burnett and Runner Up-Dana Cavalea, for anyone that might not know he is the strength and conditioning coach. Skeeball: Winner-Andrew Brackman and Runner Up-Eduardo Nunez Pop-A-Shot-Winner-Royce Ring and Runner Up-Mark Melancon Here are some of the comments from Mark Teixeira that were obtained by Mark Feinsand of the NY Daily News. "The highlights were A.J. Burnett just smoking the field in the video game racing, and Royce Ring probably being the best pop-a-shot basketball player I have ever seen." 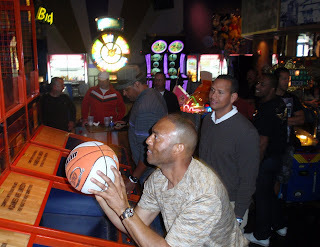 Mariano Rivera was last years big winner in the pool tournament but his name wasn't on the winners list this year. Here is what Teixeira had to say about that "I don't think he did as well, but I don't want to throw him under the bus. At pool he was definitely head and shoulders above the rest, but these arcade games leveled the playing field a little. I won't throw anyone else under the bus, but I admit the race car game was a little difficult and I finished last in my heat." He also added that "It was a great day, the fact that we get three or four hours not to have to worry about baseball and not have to compete on the baseball field, it was fun. Playing video games, we felt like kids again. It promotes a light-hearted atmosphere." Joba Chamberlain had flu like symptoms and didn't attend the outing today. He will attempt to throw a bullpen tomorrow and if he can, he will stay in line to pitch on Friday but if not plans will be adjusted. The Yankees also announced the probably pitchers for the games on Thursday and Friday, here they are: Thursday at Philadelphia: CC Sabathia, Kei Igawa,Zach McAllister,Mark Melancon,Ivan Nova,Romulo Sanchez. Friday vs Tampa Bay: Phil Hughes,Joba Chamberlain,Jeremy Bleich,Grant Duff,Dustin Moseley,Hector Noesi,Dave Robertson and Kevin Whelan. The New York Mets had a intrasquad game today and will have their first exhibition game tomorrow. Manager Jerry Manuel told reporters after the intrasquad today that Johan Santanas first start will probably be on March 9th. Jose Reyes hit a leadoff triple in the first at bat he had today, he showed no lingering effects of his hamstring as he was running around the bases. This was a very welcome sight for the Mets and all of their fans, this is something you should see quite often in Citi Field if he can stay healthy. Jose Reyes is the sparkplug and I really think he needs to remain the leadoff hitter but I think he will bat third until Carlos Beltran comes back. Tomorrows game is at 1:00PM against the Braves. Nelson Figueroa will get the start. The lineup will be Gary Matthews Jr. hitting leadoff and playing center field followed by Luis Castillo,Jose Reyes,David Wright,Jason Bay, Mike Jacobs who will DH, Jeff Francoeur,Ike Davis who will play first and Chris Coste will do the catching. There wasn't much else coming out of today, Matthew Cerrone on his blog, this is where I got the lineup for tomorrow stated that it feels much looser in camp this year and that there is better chemistry. I hope the Mets do have a better attitude and stay healthy, if they do that they can win some games, but pitching is the key and they need someone from the group of Mike Pelfry, Oliver Perez and John Maine to step up. There were a couple of pretty big stories coming out of Tampa today. The first one has to do with Alex Rodriguez although this time he is not the focus. The Feds will meet with him regarding Dr. Tony Galea, the association is with Dr. Mark Lindsay who was managing A-rods hip rehab. New York Mets shortstop Jose Reyes met with the Feds already as part of this same investigation. Here is what A-rod had to say "This is about someone else, I am going to cooperate as best as I can and focus on baseball." The Yankees issued a press release that said "The New York Yankees have not been contacted with regard to an investigation of Dr. Tony Galea. The Yankees never authorized Dr. Tony Galea to treat Alex Rodriguez, nor do we have any knowledge of such treatment. The Yankees authorized Dr. Marc Philippon to operate on Alex and oversee his rehabilitation. At the request of Dr. Philippon, we also authorized Dr. Marc Lindsay to supervise the daily rehabilitation program established by Dr. Philippon. We will continue to monitor the situation." A.J. Burnett threw live batting practice today, he threw 30 pitches. He didn't throw a curveball and said he thinks he threw 12 changeups. He said he knows what other teams scouting report will be on his changeup "Has one, never threw it but he might." He has spent the winter trying to improve his changeup, which he has only thrown occasionally in his career. He only threw fastballs and changeups today and said he will probably do that through his first 2 or 3 starts of the spring. He said watching CC throw last year and he is a power guy and how much he used the changeup and how good of a pitch it was for him basically inspired A.J. to try and better himself. I love to see this with these pitchers, I really feel the group the Yankees have push each other and they aren't satisfied with winning the World Series, they want to keep winning. Andy Pettitte is the only pitcher throwing batting practice tomorrow, he will do so at about 9:00AM, there will be a few others who will throw a normal bullpen. The players will be out of camp by 10:00AM for there big group outing which we still don't know what it is. I guess we will find out tomorrow but it looks like it may be another pool tournament. Chan Ho Park threw 35 pitches today and Damaso Marte threw 25, they will both throw again on Wednesday. Andrew Brackman threw BP on a backfield and was impressive for his first time out. He is still a guy the Yankees have high hopes for, this is a big year for him to start to show what he has. Jose Reyes said today that he met with the FBI on Thursday. The reason for that meeeting was his association with Dr. Tony Galea who is under investigation for drug violations. Jose Reyes said he wasn't worried because he knows he hasn't done anything wrong. He said basically he took my blood out, spun it in a machine and then put it back in his leg. He said the FBI told him there should be no problem with him. Mike Puma of the New York Post had a article on Jason Bay in todays paper. Jason Bay stated that he would like to improve on his 267 batting average from last season. He said he feels he is a 275 or 280 hitter. He said strikeouts are part of his game and he used to get upset by them but not anymore. He said as long as he is doing the other things he is ok with the strikeouts. David Lennon has a report for Newsday about Jeff Francoeur. He stated that he feels that his performance over the last 2 months of 2009 will carry into 2010. Darryl Strawberry has taken a special interest in him this spring and said he is on the verge of a breakthrough season. Strawberry said he should be a 25 homerun and 90-100 rbi a season guy. Chan Ho Park arrived in camp today, he said he has been throwing in Korea. He long tossed today and will throw a bullpen tomorrow. Edwar Ramirez was designated for assignment to make room on the 40 man roster for Park. The official press release from the Yankees can be found here. Chan Ho Park will wear number 61. Brian Cashman said they are treating him like today was his first day of spring training, which it was technically. He was throwing bullpens and training in Korea but the Yankees will start his throwing program the same way they did the other pitchers. He will throw a bullpen tommorrow and Cashman said he won't get into a game the first week of exhibition games. That still will give him enough time to be ready for opening day, the Yankees just don't want to rush him and have him get hurt. Here are the pitchers who threw live batting practice today: Group 1-Joba Chamberlain, CC Sabathia, Phil Hughes,Boone Logan,Zach McAllister,Ivan Nova,Hector Noesi. Group 2: Kei Igawa,Dustin Moseley,D.J. Mitchell, Mark Melancon,Jeremy Bleich,Kevin Whelan. CC Sabathia threw 28 pitches today. He faced Mike Rivera,Marcus Thames,Randy Winn and Nick Johnson. He said this "They didn't take many swings, but it is good to have that hitter judge your pitches. It doesn't matter whether they swing or not." He was asked if he is ready to finally pitch in a game and he said " We will see, I feel good though. My bullpens went real well, I get Monday off then throw another bullpen, so I will be fine. I'm looking forward to it. Today definitely helped, getting back going and getting used to facing guys."